The Tecno N3 came in sometime last week. Here are opinions and thoughts while using the device. We’ve split it into parts so you can jump right into a section by clicking any of the titles below or you can read the whole thing. 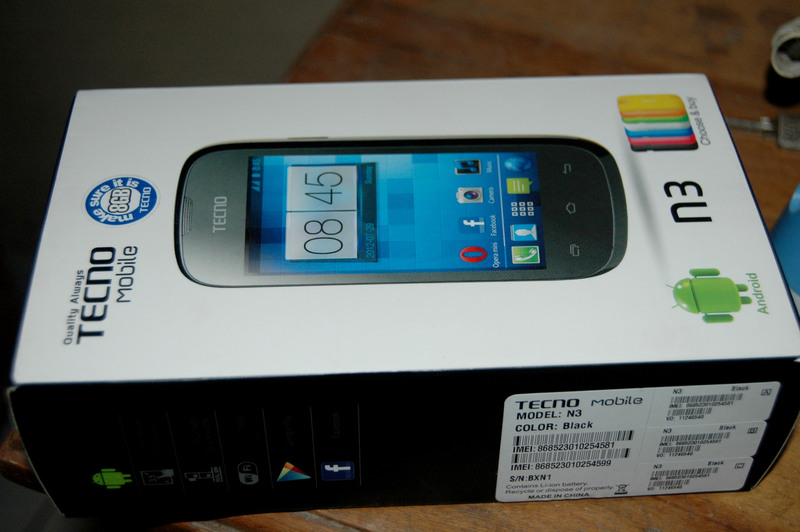 The Tecno N3 is made entirely of plastic. It’s Light enough yet not too light so it feels like you’re holding a phone. There are volume buttons on the top left, sleep/on button on the top right, 3.5mm audio jack at the top and a micro-USB port at the bottom. The usual home, back and menu buttons for Android are at the bottom. Its camera pops out of the top, right in the middle of the device. I have the black version with me, it also comes in Red, White and a special Arsenal version pre-loaded with Arsenal content. The design isn’t mind blowing but it works. As for durability, it fell down once from a stool and the back opened with the battery out. You probably want to get a pouch for this phone. The N3 runs Android 2.3.5 Gingerbread on an 800Mhz Qualcomm CPU and 512MB of RAM. Internal storage comes at 512MB with an 8GB memory card included. The phone can take external cards up to 32GB. Although the unit in this review has a 256MB RAM so there’s a bit of lagging although it’s not frequent. The device sports WiFi[with hotspot abilities], Bluetooth, A-GPS, an accelerometer and gyroscope are included. The phone has 3G capabilities in places where 3G is available. 3G works fine and I’m quite impressed that it picks up networks better than the BlackBerry Curve 9320. The Tecno N3 comes with a dual-sim capability and you’re given the ability to tweak certain capabilities of both SIMs. For example you can turn off data completely on one SIM and make the other your primary data SIM. I did find it difficult locating the buttons at night due to its lack of backlight. 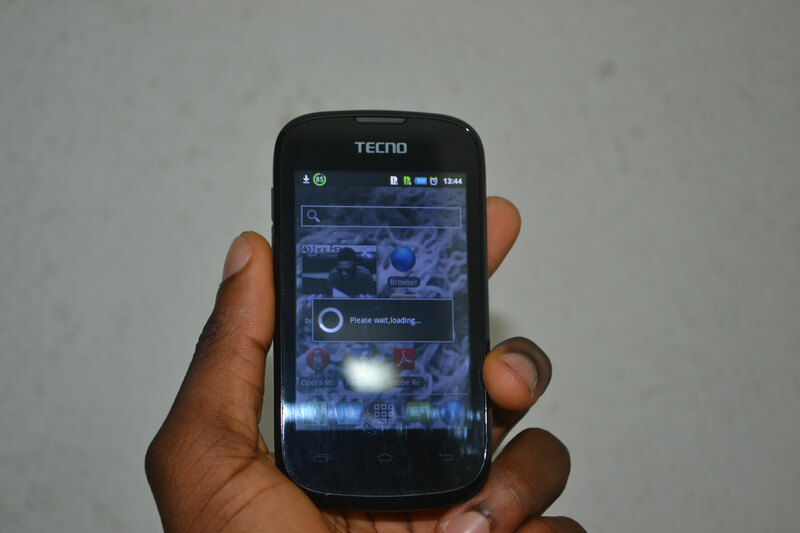 The Tecno N3′s screen is a 3.5-inch, HVGA screen with a resolution of 320×480 pixels. It’s bright enough for you to see it in moderate light and in the dark but when it’s super hot and bright like it is in Lagos right now, I had to squint to see the screen when I was on the road. Its rear-facing camera is 3.0 megapixels so don’t expect awesome photos. It doesn’t work well in low-light situations, although you can tweak the white balance and exposure. However, images become blurry when you use the zoom option so you’ll want to move as close to your subject as possible when you’re using the camera. The N3 lacks a front-facing camera so there’s a difficulty in making video calls. Here are sample images and a video. The images and video are unedited. This is exactly how they are on the N3. Here’s a sample video of the Tecno N3′s camera. It works fine during the day although it doesn’t pick colours as well as we expected a 3 megapixel camera to. Tecno’s N3 comes with an earphone, a mini-USB cable and a power plug. The earphones are quite loud so you don’t want to walk the streets of Lagos without tuning down the volume. The internal speakers work fine and like the earphones they can also get pretty loud if you turn the volume up. The screen isn’t protected by scratch proof glass which means a screenguard is required if you want to use this for a long time. 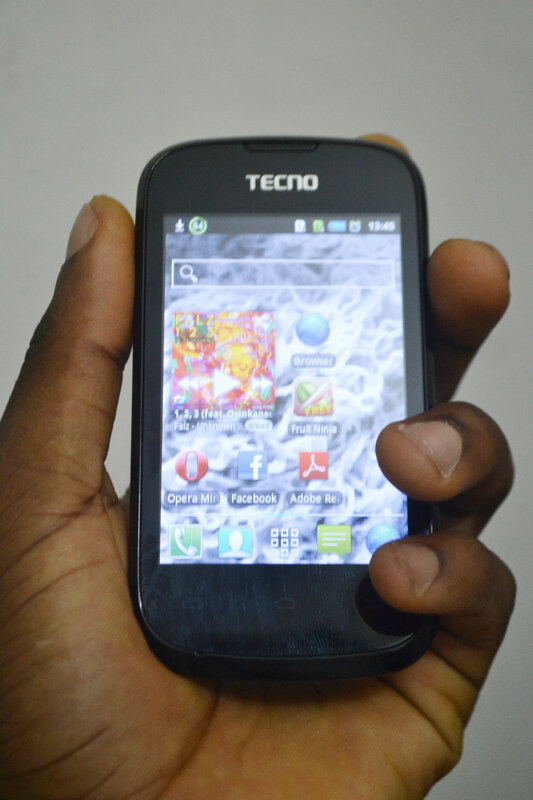 The Tecno N3 runs Android 2.3.5 Gingerbread. That’s an Android operating system from about 2 years ago. It’s not up-to-date but it works just fine. A large number of Apps available for the N3 work well – apps for Social Networking or reading content have no problem. The lock screen has special options to switch to the Phonebook, Messages, Camera and your home screen. Tecno also added a few extra features to the top bar of the notification centre like turning of mobile data or switching between different display brightness options. I really loved the brightness tweaking option. It saves you all that time of going to settings. If you’re switching from Jelly Bean like I have, the major difference is that you can’t pause, play or fast forward music from the notification centre like you can do in Jelly Bean. You also can’t view notifications from the lock screen. In settings, you’ll notice is that there’s no ability to view how much data you’ve consumed. Another problem is switching from your running app to your home screen and then to menu. The phone takes a while to load you onto the home screen like you’ll see in our review video. This is probably specific to this phone because that doesn’t happen on Samsung’s Galaxy Pocket. I noticed the Tecno N3 did a bit of refreshing of apps. When I switch away from an app and I want to return, it restarts the app. For browsers like Opera Mini, it refreshes the pages or will sometimes end your session. I’ve been told that happens with a lot of Android devices although I never noticed it on my Nexus 7. The N3 Comes with Spinlet and 175 Spinlet credits loaded, a special battery saver app – DX battery saver, Email, Flash Share, Facebook and Opera Mini next. Tecno says they’re working to include 2Go support and Whatsapp functionality so you don’t have to download it. Tecno has pre-installed a special Flash Share app that allows file sharing for Tecno phones. When 2 users wish to share files, they can create a quick account(works offline within Flash Share and transfer files via a specially created network. The Videos app isn’t great for playing movies so I suggest VLC For Android Beta. Due to the processor of this device, The maximum resolution of videos that can be played is 480p. 720p videos hang all the way. If you like games like Temple Run and Agent Dash, sorry they won’t run on this device. The Music app also works fine. It can play mp3 and midi files. I encountered no problem using it. The hardware isn’t top notch enough to allow you play games that include running and sliding simultaneously. I also noticed large-sized games around 100MB or above won’t just work. I Charged up the N3′s 1400 mAH battery till its fullest at 9.30 AM and didn’t have to recharge it until 7 PM. Within that time, I had no SIM card on the device so I relied on WiFi for about 4 hours during the day. I also played music throughout that time. When I eventually inserted a sim card and turned on mobile data, the battery lasted about 6 hours. This is largely due to network inconsistency. It should usually last between 8 to 10 hours without recharging. The best part about the Tecno N3′s battery is that the N3 is equipped with the DX Battery Saver app I mentioned earlier. The app alerts you when your battery is going low and offers to switch to special modes that can turn off certain radio services and even reduce brightness. It also accurately estimates how long it’ll take the phone to get a full charge. The closest competitors to the N3 are the Saumsung Galaxy Pocket and Etisalat/Huawei’s Gaga. We couldn’t get a Gaga for this review so we’ll compare the N3 with the Galaxy Pocket. The N3 scores better than the Galaxy Pocket in terms of screen size, weight, hardware support and price. Although, the Galaxy Pocket has more internal storage at 3GB than the Tecno N3, but the N3 comes with an 8GB memory card. Where the Galaxy Pocket trumps the N3 majorly is in its camera. It’s a 2 megapixel camera but it is brighter and takes pictures faster. On durability, the Galaxy Pocket’s back is made of brushed metal so you can let that fall sometimes. The Pocket’s home screen buttons are also backlit which is useful at night. The Tecno N3 wins in terms of pricing and basic specs but loses in the camera and ability to play large apps. It has the potential to reduce the market share of Samsung’s Galaxy Pocket and other near-priced Android phones. When this phone officially hits the market, consumers will be able to buy Tecno N3 units from Airtel and get 40MB data for 6 months, provided they load N1,000 of airtime each month. All you have to do is load the stated amount of airtime. Tecno is promising even more Android phones in 2013, we’ll be watching to see how much market share they can capture in Nigeria. 95 percent of all phones in China currently run on Android, we’re looking to see if that can happen in the Nigerian market. If you’ve used the Tecno N3, we’ll appreciate it if you leave us a comment about your experience. I’m currently using Techno n3. wel, its quite a great fone, but d onlh problem am having wit it is d inability to run large sized apps and the closing down of my browser wen a call cums in. This is a nice phone but rather underwhelming the Gtide E7 packs a better punch and costs less. pls who has an idea? I must have used it imaginarily then. As well as 2 of my friends. The ram capacity differs with units. The black shell seems to come with 256 ram while the white shell with 512. I confirmed these differences for myself when i bought my own unit, a 512 ram, by the way. This will explain why different people have varying testimonies as to the hardware performance. has the N3 got fm radio? Binjo how did you upgrade your n3 OS? Also, can you root the phone? Just heard of the tecno d3 too. Pls post the specs I need to make a decision between n3 and d3. is this an armv6 or armv7? is the gpu an adreno 200 or higher? Just saw a blog where this phone could play Modern Combat 4…. Does n3 whatapp work for both sims? please this n3 can i make subscription like the way blackberry subscription is? yes u can with mtn line and on configuration on ur phone and until download as much as possible even connect to your system through urgent hotspot. What is d subscription code for Airtel-n3, and how much does it cost? I love such clear review you made about this phone, thanks. I just love the phone and can’t wait to have one soon, but my fear now is on the area of camera not been able to produce quality pictures. How do i configure my tecno n3. Very impressed with your site. Thanks for the info and more grace to your elbow. Keep up the good work! tecno n3 is more than capable of running hd games. temple run is nothing, it runs that at full speed. for pete’s sake, it’s cpu is 1 ghz! so do ur research very well nxt time b4 u start spreading those malicious lies. thank you. tecno n3 does not refresh no apps on switching to another app. i’m sure it’s not the same tecno n3 that i use which u reviewed, probably a chinko. thank n3 for displaying in nigeria market i even proud to be one of ur regular consumer/markerter in jos city keep on spraying thank. How come U got a 512 ROM(internal memo).Mine is 128 and I have not seen any higher.Giving me a whole lot of headache on apps issue though I still have 5G in my SD.Apart from that tis a great phone for a start and at that price.Any advice for me on the memo iss#? Pls. which one is good from n3 and d3? please i need answer ASAP bcos i want to buy me NOW, Thanks. which is beta N3 or D3? PLEASE GUYS, BETWEEN N3 AND D3, WHICH ONE IS PREFERABLE AND WHOSE BATTERY LAST LONGER. actually, u tried with ur reviews, buh u made sum mistakes, which i would mention buh few 1. Temple Run run extremely great on N3, i have played d game severally on my N3 nd i can tell u dat i didnt notice any laggin 2. Tecno N3 runs games that are larger dan 100MB, u can search for Real Football 2012 @ google play check d size nd confirm 4 urself (RF 2012 is 399MB) i have it also on my phone 3. my Tecno N3 also came wit 2go Pre-installed on it…sincerely i would recommed Tecno N3 to anybody, anytime nd anyday….thanks! J'ai le N3 mais j'ai perdu quelques application comme le map,la bible,le coran quand j'ai accepté une demande de DX Batterie,comment faire pour les faire revenir. this phone is the bomb. only issue is with the camera, but overall, its a super gadjet. Does tecno n3 and t3 supports watsup? I'd be very grateful if you could elaborate a little bit further. Kudos! dos tecno n3 do online streaming? is it true that the fone is of 2specs one with 512 Ram and one with about 200 Ram? pls i cant locate message menu on my n3. pls educate about sms settings on n3. thanks. Like this? Don't miss out on more!